The Flour & Grain Exchange building is located at 177 Milk Street, just one block south of the Custom House. The beautiful granite structure was completed in 1892. The architectural style is Romanesque Revival, with tiered arched windows and a conical roof at the northwest corner. The Boston Chamber of Commerce occupied the building from 1892 to 1902, prior to the Grain Exchange. 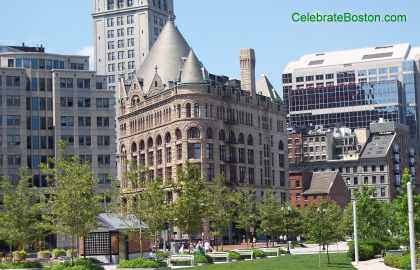 The plaque on the building states: "Originally a meeting hall for the Boston Chamber of Commerce, the Exchange was built on land donated by streetcar magnate Henry M. Whitney and completed in 1892. Shepley, Rutan and Coolidge designed the tiered arches and rock-faced masonry which exemplify the Romanesque Revival style of H.H. Richardson. The sturdy walls and elaborate design reflect an expression of financial security appropriate to the city's commercial circles. The exterior was restored by The Beal Companies in 1988." A 1916 description of the building is as follows: "that unique architecturally granite structure, irregular in plan to conform to the limitation of its site, at the junction of India & Central Wharf, with its rounded front carried up as a tower capped by a lofty conical roof [which is] pierced with high dormer windows, and [at] the corner on India Street, similarly rounded into a small tower, now in curious contrast to its neighbor, the reconstructed Custom House." Nearby attractions to Mercantile Wharf include the New England Aquarium, Quincy Market, and Faneuil Hall.